Thanks for visiting my page with a quick overview of my coop. 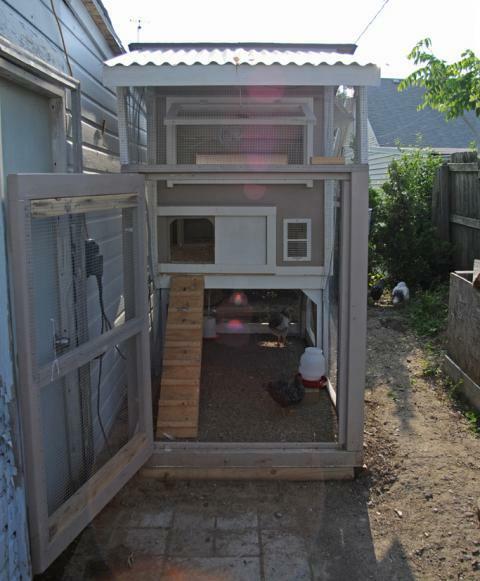 Let me first start off by saying I build this coop to fit OUR needs and I started off with a very rough draft on paper.... Well, plan are made to be broken and I found myself "winging it" along the way. I'm in no way a capenter, period! I believe ANYONE could make this. One thing to keep in mind is that you should double your budget and double the time you think it's going to take you! Just ask my wife! 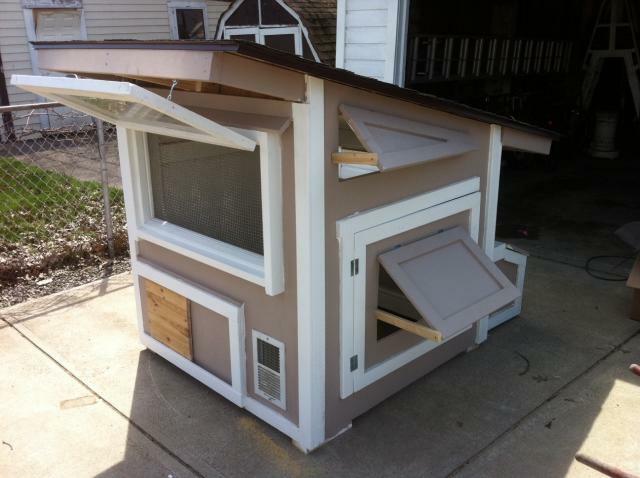 I thought I could build this small coop for $250 or so... ha! NOT! I'm in about $500 total so far and still have a bit to go... But I'm doing it right and not cuting corners. Keep this in mind, this is no joke! 2x4's..... I used a lot of them, and keep going back to buy more. They're about $2.40 each. Plywood - I used 3/8" - 2 or 3 sheets $13 a sheet or so? 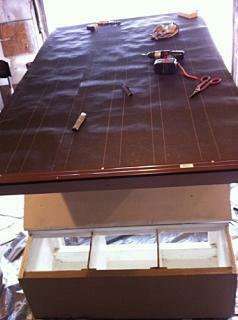 Furring Strips - I bought a ton of them... and used them for trim work & window trim. Paint - $18/gal (x 2) I mean, you're not really going to paint it all one color right? Plan on two! Covered Run? I'm adding another $50 for roofing materials! More trips to HD??? YES! I'm still not finished! THIS ALL ADDS UP SO KEEP THIS IN MIND! 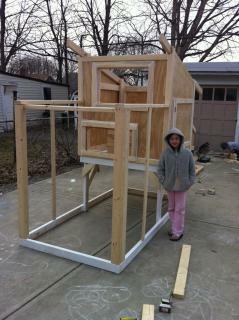 The frame: Made everyting 4ft x 8ft to make it easier for the cuts - All 2x4's untreated. 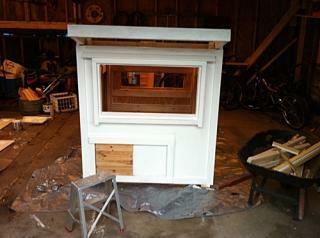 Once I got the walls on, we used 2" furring strips on all edges - Caulked all joints with silicone caulking! They're cheap and worked perfect. Overall height is almost 8ft By code (abouth 7'11" to be exact) I needed to be under 8ft without a building permit from the city of Cleveland. Since it's been raining for entire month of April, I took the unit apart and worked on it in the garage so we could work on it. You may notice the window is slightly larger than in earlier pictures - I decided to go larger for more airflow in the summer so I'd rather do it now! Garbage picked the window! 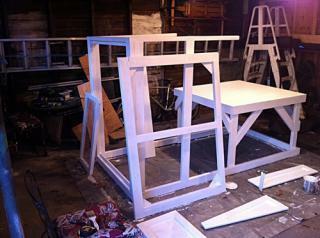 The frame - You can see we added supports for the legs in this pictures. All 45 degree cuts and nailed in. What a huge difference they made! 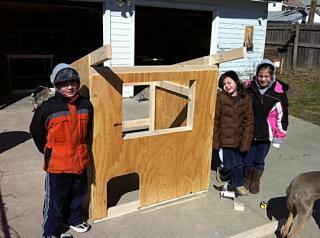 The kids did an amazing job priming and we all had a ton of fun! Painting completed! 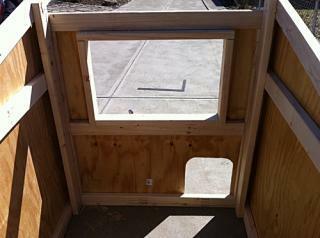 Window in, brackets on! Also, notice the soffits for airflow. from dripping on top of it. 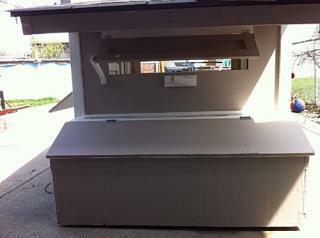 I also used drip edge around all edges for extra measure. Drip edge prevents water from running back under the wood. Bought the shingles off of craigslist for $10 for 45sq. ft! 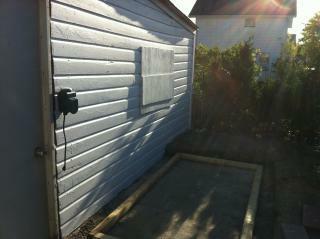 Juest enough, the roof is 5ft x 8ft. Nesting box open - I put two layers of roofing paper down, one the traditional way, and one long ways for added weather protection. 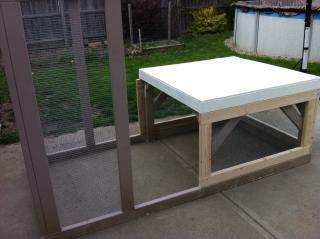 landscape timbers and 1/2" hardware cloth to keep animals from digging under the coop. 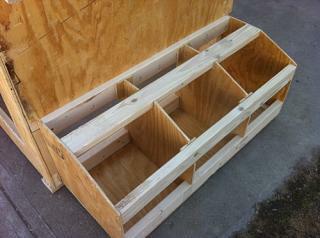 This will sit on the ground and the frame will be assembled on top of it - See below. Just about all screened it with 1/2" hardware cloth! - Repaint Needed. 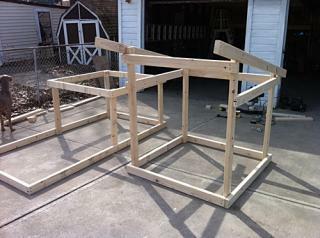 I had to build frames because the coop is 32" off the ground and the hardware closth is 24". I can add hinges and use it as access if I choose? 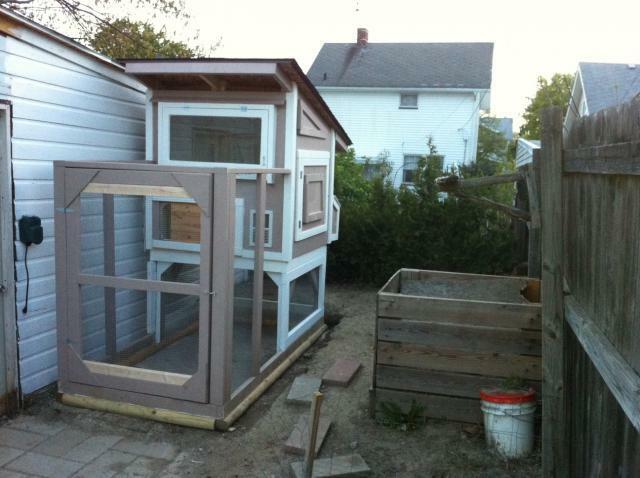 5/9/2011 - We're moving the coop tonight! 5/10/2011 - Update - Coop has been moved into place! 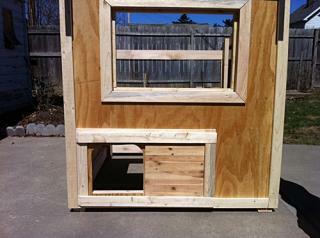 *Although we started off with 6 chickens it seemed a bit cramped in there for them all. We found out that our two Columbia Wyandottes were roosters and gave them away to a happy home. We're Almost Complete and the chicks are now 5 weeks old! Not long now! Some brilliant costing for materials. It looks well built and long lasting. Very nicely done. Love the paint selection. I love it! it is so nice! It is beautiful! You were right to make the room under the coop higher. Most are too low. 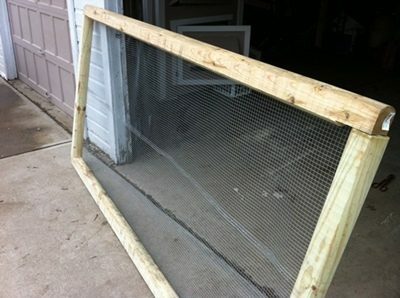 There is a way to connect an arm to slide the coop door open and closed from the outside. But your entry looks easy as well. Wow! 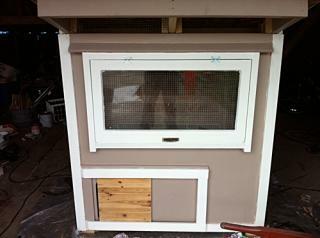 Love the sliding coop door!